St. John Tradewinds Senator Tregenza Roach met recently with about 30 seniors who are strongly opposed to the Department of Human Services plan to close the Adrian Senior Center at George Simmons Terrace and move them to a program at St. Ursulas Anglican Church in Cruz Bay. Further deepening the seniors opposition and frustration is the departments move to offer the activity and enrichment programs only two days per week. In listening to the seniors at the Adrian Senior Center, it goes without saying that they are passionate about their facility, said Roach. Continuously, they have expressed that they are a family at the center. The seniors strongly shared their desire for the Adrian Center to remain open on its regular scheduled days. Several seniors voiced their dissatisfaction of having to relocate, he said. I am concerned of the currently attend the Adrian Center, will not partici pate in the activities at St. Ursulas if the change in location is put into effect. It is a hardship to seniors, only two days per week and then to further exacerbate that action by moving them to another site. A similar action took place on St. Thomas with the Annas Retreat Senior Center. The facility closed and those seniors were then required to utilize the Hospital Ground center. Following this action, a number of seniors did not attend, and certainly their quality of life declined. Some seniors who utilize the Adrian Center have worked for the Government of the Virgin Islands for 27 to 40 years, said Roach. Now in their twilight years, the Government should surely bend over backwards to accommodate them by providing the services and facilities they need and enjoy. Also at the meeting was Department of Human Services Assistant Commissioner Michal RhymerBrown who assured seniors that the department will continue to look into viable solutions based on the concerns raised and will close the center only as a last resort. Roach was encouraged by the departments recep tivity to the concerns and desire to not cause undue cant part in the lives of the seniors, he added. 2 St. John Tradewinds, November 18-24, 2013 Senator Roach Meets with St. John Senior Citizens To Discuss Adrian Senior Center EDITOR/PUBLISHER MaLinda Nelson malinda@tradewinds.vi NEWS EDITOR Jaime Elliott jaime@tradewinds.vi COLUMNISTS & CONTRIBUTORS Andrea Milam, Mauri Elbel, Chuck Pishko, Yelena Rogers, Tristan Ewald, Andrew Rutnik, Craig Barshinger, Bob Schlesinger, Jack Brown, Mares Crane, Dan Boyd, Bob Malacarne NEWSLINE (340) 776-6496 www.tradewinds.vi editor@tradewinds.vi ADVERTISING advertising@tradewinds.vi CIRCULATION Rohan Roberts MAILING ADDRE SS Tradewinds Publishing LLC P.O. Box 1500 St. John, VI 00831 SUBSCRIPTIONS U.S. & U.S.V.I. only $90.00 per year THIRD CLASS PERMIT U.S. Postage PAID Permit No. 3 St. John, VI 00831 COPYRIGHT 2013 All rights reserved. No reproduction of news stories, letters, columns, photographs or advertisements allowed without written permission from the publisher. TRADEWINDS PUBLISHING LLCThe Community Newspaper Since 1972 Several seniors voiced their dissatisfaction of having to relocate, he said. I am concerned of the likelihood that Center, will not participate in the effect. It is a hardship to seniors, them to another site. Senator Tragenza Roach Gifft Hill School is proud to announce the 4th Annual Gifft Hill School Gives Back community service day on Friday, November 22. All students and faculty from preschool through 12th grade will take part in this event and give back to the community with service projects throughout the day, all over the island. For more information, to volunteer, or looking for help with a project at an organization, contact Meghan Duffy or Molly Murrill at 776-1730.GHS Gives Back Day Is November 22 Audubon Meeting Set for Nov. 19 Audubon Club meeting of the season on Tuesday, November 19, Kessler will tell the group about the childrens book she wrote Hope is Here, about Hope the Whimbrel, which will be given to Virgin Islands school children at First Lady Cecile deJonghs Christmas parties and at local schools. CBCC Annual Meeting, Potluck Nov. 18The Coral Bay Community Councils Annual Meeting and potluck is rescheduled for Monday, November 18, at Miss Lucys from 4:30 to 7 p.m. Dinner will begin at 5:30 p.m. with the business meeting beginning at 6:30 p.m., during which time the group will elect board members. great effort to prepare delicious food for what was a rain-cancelled event. We were disappointed too, said CBCC President Sharon Coldren. We hope you will surprise us with another wonderful dish on November 18! And to those who cannot make this rescheduled event, we also apologize.GHS Hosting Strategic Planning Workshop at Westin on November 16Gifft Hill School will be hosting a Strategic Planning workshop on Saturday, November 16, from 9 a.m. to 2 p.m. at the Westin St. John. The purpose of this workshop is to consider the needs and future direction of the school and create action steps to implement this plan. Input from the community is welcomed. To participate call Molly Murrill or Beth Jones at 776-1735. IGBA Green Thursday at GHS Nov. 21The Island Green Building Association will kick off the 2013/2014 season of its popular monthly Green Thursdays seminar series on Thursday, November 21, at 5:30 p.m. at the Gifft Hill Schools upper campus auditorium. Villa owners and managers, as well as anyone whos interested in IGBAs drive to green the tourism industry, is invited to attend this months seminar, where IGBAs new Green Villa Membership Program will be discussed. The Green Villa program aims to guide villa owners and managers toward a less expensive and lower-impact lifestyle and busiprovide tips on reducing energy and water costs, and show villa owners and managers how the program offers a competitive advantage in the rental market. St. John Tradewinds, November 18-24, 2013 11 I G L by Lovango Cay resident Dan Boyd St. John Tradewinds With WAPA rates being sky-high and soon to go up again the latest increase is set to take effect on December 1 I thought it would be a good idea to discuss energy saving ideas. Hot water. Did you know that with an electric water heater, your hot water is about 25 percent of your electricity bill? The average house spends about $75 per month on electric hot water alone. You can cut that way down. Solar hot water systems are great, and getting better and better all the time. Of course, it does involve an investment to install solar hot water at your home. One quick payoff is to simply to use less. When you are not home or when you do not plan on using your hot water, shut it down. You can turn off your water heater either on the unit or at the breaker. If its not turned on it will not consume power! You can even have a timed switch installed, the type that you twist to 30 or 60 minutes, and that way you will not forget to shut it off. Or if you keep a regular schedule, you could set up a timer that will turn the heater on and off around the times you will be using hot water. Electronics. Be mindful of standby or ghost power. TVs, cell phone chargers, computers, and printers all are drawing electricity, even when they are off and not being used. Plug them into a strip cord, and switch off the strip cord when not in use. You will be amazed at how much energy this simple trick will save. Solar powered cell chargers also work great! You do not have to leave your phone in the sun, either. Just lay the small 4x4 solar panel in the sun for a Energy Savings Gadgets SPACE IS LIMITED, PLEASE SIGN UP BY 12/08 $35/pp payable by cash or check made out to Vicky Pedersen Pay at Connections Cruz Bay or Connections East Be at VI National Park Dock in Cruz Bay no later than 4:45p.m. light refreshments provided Memorial Sunset Sail on Kekoa forV PSunday, December 15 few hours, and it will store the solar energy in its built-in batteries. When your phone starts running low, all you do is plug it in! I paid $15.00 for the charger I have, and it has saved me from a dead battery on a number of occasions. Solar-powered generator. The SUNRNR (pronounced sun runner) is a renewable energy storage device, much like a portable gas-powered generator, but it makes no noise and does not consume fossil fuels. You plug the solar panel into the SUNRNR to charge it up. When electricity goes out or when you want to run without WAPA power, you just plug your appliances into the SUNRNR and you are ready to go with 2,000 watts of power. These units are great for boats, camping, or just living off grid if you so desire. (Island Solar is an authorized SUNRNR dealer; contact me if you want to learn more.) nances and your energy consumption. Turn off lights when youre not in the room, use fans instead of air conditioning, wash large loads when washing clothes, and hang your clothes out to dry instead of using the dryer. A clothesline will not only save you money, your clothes will smell better, too! For a greener tomorrow. vendor. For more information call Boyd on his cell phone at 340-6269685 or by email at islandsolarvi@gmail.com. 14 St. John Tradewinds, November 18-24, 2013 NEXT DEADLINE: THURSDAY, NOV. 21st Letters To St. John TradewindsAnyone who plans to carry a cat into a new island home might need to remember a basic truth about cats on St. John: it takes a month or more of explore outdoors. Allowing a newcomer immediate outside-access can be disastrous A cat who is new to a place is entering a territory most likely held by a small resident colony of homeless cats, some abandoned or lost, others born in the wild. They may hide in the bush and never be seen until a new foodsource appears. For survival, a colony guards its territory from newcomers. If threatened or stressed by resident cats and unfamiliar territory, a weak or old newcomer cat may fail and die. A young frightened newcomer may bolt and try to return to her old home, often getting lost or killed along the way. tion about her new environment. She and the outdoor residents will have time exchange signals, each becoming accustomed to the presence of the other. At the end of that month, the door can be left open for her to explore her neighborhood. The more time she and others have to adjust their instinctual responses to each other, the better life will be for everyone sharing that place: the newcomer, her owner and the resident colony. Name withheld upon requestGuy Benjamin School students would like to thank the V.I. Audubon Society for making their Positive Behavior trip to Trunk Bay on Wednesday, November 13, possible. V.I. National Park Ranger Laurel Brannick took the students snorkeling and Earnest Matthias helped to lifeguard. The students enjoyed lots of fun in the sun, and plenty of food! who were give few We Expect Better Behavior (WEBB) notices. St. John Tradewinds News Photo Courtesy of Mary Burks St. John Tradewinds News Photos on cats. 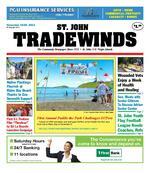 St. John Tradewinds, November 18-24, 2013 15 Friends of VINP Annual Gala Set for February 1St. John Tradewinds The world of pageantry has had an important world before I could even walk or talk. just an infant. Some may see this as my mother attempting to live vicariously through me, but theyre wrong. She and my aunt had done pageants in the past and they both decided that they loved the experi ence, and thought I might look cute in a small frilly dress and win a few prizes for doing it. In the beginning my mother had no idea that I would pursue pageantry feverishly as I got older. She only placed me in the occasional pageant or two until I got to an age where I could make the choice myself. On that day we were sitting on the couch looking at an advertisement for a nearby pageant. My mom put down the paper, looked at me and said, Now Raven, youre old enough to decide on this. Is this what you want to do? Without hesitation, I quickly nodded my head yes and picked the paper back up. In all honesty, I was very much preoccupied with the girl in the picture. She was so pretty, so poised, and so happy looking. I immediately felt the need to be her or just like her. My mom picked up on this immediately as well. That day, a long journey began for the both of us. While I trained, practiced, and memorized, she coached, preached, and lectured. Not only did she have to prepare me for each pageant I decided to par take in, she also needed to teach me about and protect me from the evils of the pageant world. You can catch a glimpse of it on the show Toddlers and Tiaras. My issue with that show is that it gives pageantry a bad name. It makes all pageant moms seem like horrible monsters and their daughters seem like shallow brats. I will admit that you will see a lot of that in pageantry, but its not the only thing you see. What you may not know is that you could be watching bright futures form right before your eyes. Pageantry is what helped give me excellent public speaking skills and a love for the art of performance. It opens up so many doors by offering scholarships and teaching young girls the importance of hard work. The harder you work and the more you focus and practice, the better scores youll get. You learn positive and worthwhile skills like public speaking, word pronunciation/ enunciation, poise, and more. All the negative side effects from pageant ry (shallowness, bratty attitudes, promiscuity in the future, a sense of entitlement etc.) can be prevented. If you teach your daughters about their inner beauty and that winning isnt everything, shell turn out for fun, not for the prizes. Amongst the bad examples on that show, there are some good people. The reason you never really see them is because no one would watch the show if there wasnt anything to start an uproar over. The more outrageous the story is, the better the ratings are. Pageantry should not be seen as an evil ploy to exploit young girls; it should be seen as a gateway. This gateway can lead down bright path towards a progressive future if you choose to let it. It all comes down to how you choose to expose yourself or your daughter to it. I still use many of the things I learned in past pageants to this day. As I prepare to partake in the 2014 Junior Miss St. John pageant later this year, Ill be sure to put these lessons to the test, and I hope to see more girls showing an interest in the world of pageantry. Rhythm & ViewsAn outlook on young adult and student interests and concerns by Raven Phillips-Love The World of Pageantry, an Insiders Perspective St. John Tradewinds a grand bravo gala this year to celebrate the groups 26th Anniversary and the accomplishments their supporters have helped it achieve. Save the date; February 1, 2014. This National Treasures gala will celebrate the treasures of Virgin Islands National Park and thank donors who have made it even better. By popular demand, Friends 11th annual gala will be at the breathtaking villa Presidio del Mar, home of Steven and Pamela Deckoff, on the point in Peter Bay. The night will feature sumptuous gourmet catering with passed appetizers all night long, dancing under the stars to In the Sand Band, and three bars Guests can take home a treasure from the abundant guests throughout this enchanted evening. This is the Gala of Galas and known as the islands social event of the year. Invitations will be sent shortly. For more info contact Friends of VINP Development Director Karen Vahling at kvahling@ friendsvinp.org. St. John Tradewinds, November 18-24, 2013 19 Friday, November 8 8:30 a.m. An Estate Contant resident p/r that a taxi driver made comments about his wife that he did not like. Police assistance. 1:30 p.m. A citizen c/requesting police assistance to remove a male from Cruz Bay beach. Police assistance. 3:53 p.m. An Estate Enighed resident p/r that he lost some documents. Lost documents. 6:54 p.m. An Estate Grunwald resident c/r that she is having a dispute with her landlord. Landlord/tenant dispute. Saturday, November 9 1:16 a.m. A citizen c/r that her son was creating a disturbance at her residence. Disturbance of the peace, D.V. 1:09 p.m. A citizen c/requesting police assistance to remove her belongings from her previous residence. Police assistance. 8:40 p.m. A citizen c/requesting police assistance with a male. Police assistance. 9:29 p.m. A citizen c/requesting police assistance with her boyfriend. Police assistance. 9:30 p.m. A citizen c/requesting police assistance with his tenant. Landlord/tenant dispute. Sunday, November 10 while on patrol in the area of Caps Place. Disturbance of the 9:35 a.m. A citizen c/requesting police assistance to remove his brother from his vehicle. Police assistance. 11:13 a.m. A citizen c/r a disturbance at the Enighed barge ramp. Disturbance of the peace. 12:52 p.m. A citizen c/r a possible drowning in the area of Hansen Bay. Police assistance. 11:10 p.m. A citizen c/r that he was assaulted in the area of Frank Powell Park. Assault in the third. 11:10 p.m. Badge #117 p/ at Leander Jurgen Command with one Kenson Jolly of Estate Pastory under arrest and charged with assault in the third. His bail was set at $25,000 by order of the court. He was detained at Leander Jurgen Command and later transported to the Bureau of Corrections on St. Thomas to be remanded. Monday, November 11 6:07 p.m. The owner of Uncle Joes BBQ c/r loud music in Cruz Bay. Disturbance of the peace. 7:23 p.m. An Estate Pastory resident p/r that a Rasta male approached her in a disturbing manner. Disturbance of the peace. 10:05 p.m. A citizen c/r a disturbance in the area of Cactus Hill. Disturbance of the peace. T uesday, November 12 12:34 a.m. An Estate Enighed resident c/r that he was assaulted near the Cruz Bay ferry dock. Assault in the third. 11:37 a.m. A Great Cruz Bay resident c/r that he fell off his balcony. Accidental injury. 8:10 p.m. An Estate Pastory resident p/r that a male stole his money when it dropped out of his pocket at Wharfside Village. Petit larceny. W ednesday, November 13 10:04 a.m. An Estate Carolina resident c/r a disturbance at Mongoose Junction. Disturbance of the peace. 10:51 a.m. An Estate Contant resident c/r a disturbance at Elaine I. Sprauve Library. Police assistance. Thursday, November 14 12:38 a.m. A citizen c/r an auto collision in the area of Estate Enighed. Auto collision. 8:30 a.m. An Estate Enighed resident p/r an auto collision, hit and run, at Mongoose Junction. Auto collision. 3:34 p.m. A citizen p/r that her iPhone 4S and $1,000 were stolen from her bag in the area of downtown Cruz Bay. Grand larceny. she expects in return. De La Rosa plays a recent transplant from the Dominican Republic with less than perfect English, who falls for Germains character and things quickly start to get interesting. Timeless has plenty of talent, creativity and professionalism at its core. What it doesnt have is funding. Far from being even a low-budget The actors are not being paid for their work they have agreed to work on deferred payment contracts and continue to work their full time jobs while Digitek, which owns its equipment, and Cutting Edge Entertainment are working gratis and have used their own funds for the Thomas Carnival, the crew is beginning work on the second half of the starter campaign to help cover costs of traveling to St. Croix, historical scene building, costumes and marketing, and is hoping the Virgin Islands community steps up to the plate. shoot, which is why we need your support, according to the Timeless Kickstarter campaign website. We will be shooting in St. Croix and building sets for Timeless West African scenes. The cast that has been will need to transport the crew as well as equipment over to St. Croix from St. Thomas. Islands, according to Timeless kickstarter website. rectly involved but it will help to serve as kick-starter (no pun intended) by the wayside, according to the site. Before Timeless, Germain had no professional acting to his credit, explained the father of two and St. John business owner. It was really crazy, said Germain. I have not had professional act ing experience and Ive never been in a full-on movie. I went to the audition and got the call back and its just been crazy since then. to buy into it 100 percent. Working with the seasoned director La Borde was a great help, Ger main explained. It was tough in the beginning but once we started getting together and doing readings and started practicing, I learned so much from Ed La Borde, he said. His tutelage made me realize he really knows what hes doing and he can really help me. the movie, he added. Its addictive, said Germain. You look at the takes and you cant believe its you on the screen. Its really fun. has agreed to deferred payment, its been a rewarding experience, he explained. basis, I have two kids and a business to run, said Germain. Its been a all perfect strangers and now everyone on the set is family. as funding comes through and the production schedule remains on time. To help ensure that happens, go to http://www.kickstarter.com/projects/ First V.I. Feature Film TimelessContinued from Page 9 To date, no tipster has ever been discovered due to a fault in the system, anywhere. If you know something, say something as law enforcement needs to know what you know. Between 10 a.m. Wednesday, October 29, and Thursday, October 30, at about the same time, a dinghy, engine and trailer were stolen from the area of Great Cruz Bay. The dinghy is a grey length, and 5 5 in width. The outboard engine is a Yamaha E15. Crime Stoppers U.S.V.I.